A new Ebola-proof tablet device has been developed that can protect medical workers from the deadly virus, and can withstand chlorine and high humidity. The tablet has a waterproof casing and was designed by a group of international technology volunteers, including Google. The gadget can be used even while wearing gloves, in storms and in high humidity, the BBC reports. Inventors say it can be doused in chlorine solution of 0.5 percent, which kills the Ebola virus. The edges around the tablet have been smoothed so they don’t rip medical workers’ protective clothing. The tablet, which has been tested at a Doctors Without Borders treatment facility in Sierra Leone, could prove a breakthrough in containing the outbreak. Until now, medical workers had to shout patient notes through fences to avoid further contamination, the BBC reports. This, however, created the risk of miscommunication and incorrect diagnosis. Ebola is passed on through body fluids, including sweat, urine and blood. Even a piece of paper could transmit the virus. Now, with the virus-proof tablet, doctors can record and store patient information digitally. Health workers will use it to track a patient's progress and monitor vital health stats, including pulse and temperature. The World Health Organization (WHO) has reported the highest weekly number of Ebola cases in Guinea thus far this year. 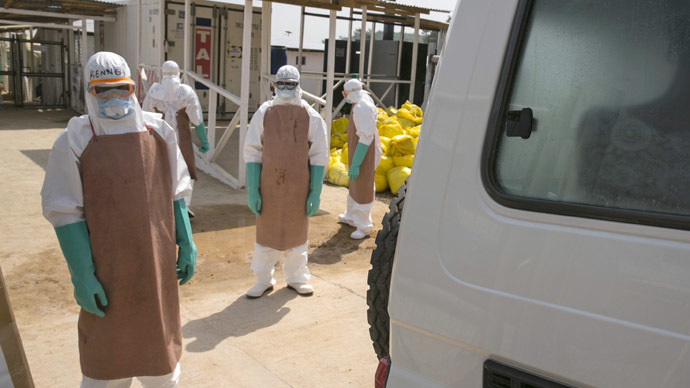 There have been more than 25,000 cases of Ebola, mainly in the hardest-hit West African countries of Guinea, Liberia and Sierra Leone, with over 10,000 reported deaths, according to the WHO. Liberia has reported no new confirmed cases for the third consecutive week and Sierra Leone had the lowest weekly total recorded since June 2014.